As I near the midpoint of book five, I’m evaluating what I’ve learned about the craft of writing and about my story. I had written the majority of what is now book three before I decided the story had five phases that could each stand alone. Also, by splitting the story, I could keep the word count reasonable for each book instead of having a book the size only certain authors can get away with. One result of this decision was the need to rework each book to make their structures standalone. Years of study and practice has increased my understanding and skill with story structure and character change arcs. Redesigning my story using that knowledge will improve the story, but the skill is not necessarily reflexive. To some extent, my innate story telling ability has served me, but to do better, I must think instead of relying on instincts. I created a chart to help me visualize my goal of creating well structured standalone books yet have them progress in an overall series structure and to prompt me to envision how character change arcs apply to the books and the series. The chart isn’t spectacular, but I find it useful to stare at as my mind explores possibilities. This is only a beginning, though. The next step is to document what my explorations reveal and plan how to pace the plot and change arcs across the terrain of each book and the series. How I handle the next step may become a blog post in the future. 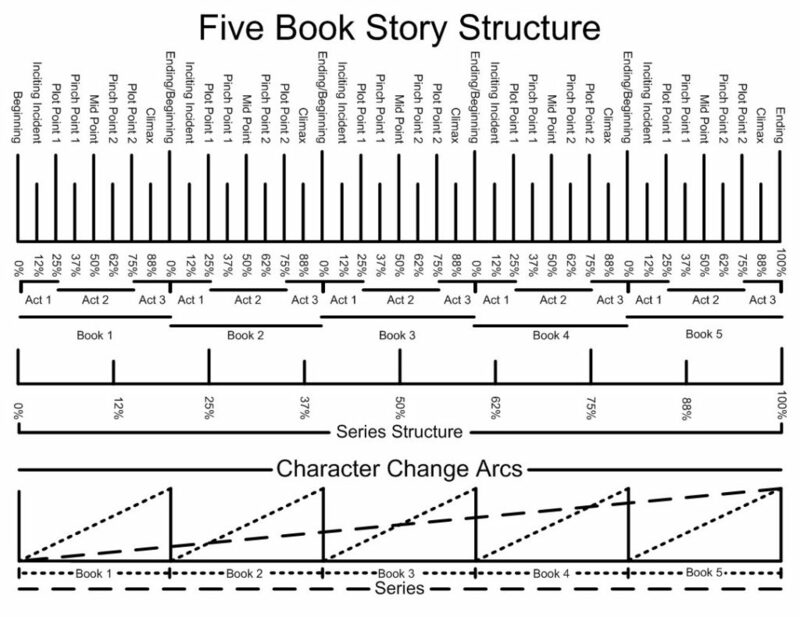 Chart for visualizing story structure across a five book series.